EXAIR's new Super Ion Air Knife removes static electricity from plastics, webs, sheet stock and other product surfaces where tearing, jamming or hazardous shocks are a problem. 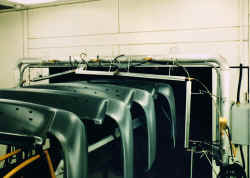 The laminar sheet of air sweeps surfaces clean of static, particles, dust and dirt. Production speeds, product quality and surface cleanliness can improve dramatically. The Super Ion Air Knife floods an area or surface with static eliminating ions - up to 20 feet (6.1m) away. A balanced airflow across its length will not cause misalignments to critical surfaces such as webs. Force can be adjusted from a "blast" to a "breeze". The Super Ion Air Knife is electrically powered, is shockless and has no moving parts. It also requires less than 5 SCFM of compressed air per foot of length at 5 PSIG (142 SLPM per 30cm of length at 0.3 BAR). Sound level is surprisingly quiet at 50 dBA for most applications. Ionizing bars are very ineffective without an air delivery system. When used by itself, a bar must be mounted within an inch of the charged surface to fully neutralize it. This close mounting is impossible when the static is generated in confined areas of a machine. Ion coverage is minimal on oddly configured parts or when high production speeds are involved. 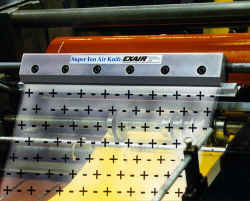 Air inlets provided on each end and bottom of the Super Ion Air Knife. Shims can be installed easily if additional hard-hitting velocity is required. Primary air does not impact any surface of the Air Knife keeping the sound level low. Insertion molded emitter points eliminate potential dirt accumulation that could degrade performance or eventually short the ionizing bar. Emitter points are sharp, durable stainless steel. The power cable is shielded and has integral grounding. The threaded bayonet connector is fully assembled and ready to use. Super Ion Air Knife Kits are available which include all components necessary for operation. 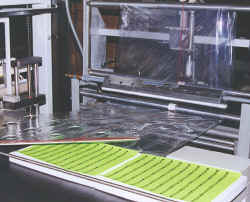 Materials stay in position on an "L" sealer when static electricity is neutralized. 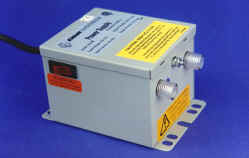 The Model 7901 or 7907 Power Supply has a lighted power switch and (2) 5kV outlets Bumpers, car bodies and fascia are cleaned of dust and fibers prior to painting. The right type of air delivery is critical. Blowers produce an uneven, turbulent airstream that can cause the positive and negative ions to recombine before hitting the charged material. They are large, suffer mechanical wear and provide limited airflow control. The compact Super Ion Air Knife uses a small amount of compressed air to produce a balanced, laminar sheet of air to carry the ions to the charged surface, even when it is far away. Flow and force are easily controlled and there are no moving parts to wear out. Special lengths up to 42" (107cm) and systems up to 120" (3.05m) are available (please contact the factory). 5' (1.52m) shielded power cable with ground and assembled bayonet connector are included. EXAIR Model 7901 or 7907 Power Supply (5 kV) is required for bar operation. Compressed Air: 1/4" NPT inlets are provided on each end and the bottom. Electrical: For use with 5 kVrms, 5 milliamperes (max.) power supply, Model 7901 (115V) or 7907 (230V). Electrical Hazard: Ionizing bars are shockless (less than 40 microamperes short circuited). Do not use near flammable materials or gases! Ionizing bars are UL Component Recognized, CSA Certified. Power supplies are UL Listed, CSA Certified.